This week, Harmony Enterprises was a featured exhibitor at the 90th Annual Exposition of the American Association of Airport Executives (AAAE) in San Diego, CA. Harmony’s Lane Powell and Nick Roberts set up their booth prior to the start of this year’s AAAE Show. Airports are undergoing expansion, improvements, and technological advancement at a rate never before seen in its industry. Their main focus is to provide innovative solutions that improve the airport experience. Airports are striving to maximize their efficiencies in the work it takes to provide this quality experience. Improving sustainability practices through recycling, solar energy, and other waste stream mitigation efforts are at the front of many airport projects. Airports are challenged to do less with more all the time. Employees in all areas are stretched to perform tasks at nearly impossible levels with decreasing budgets and time allotted. Harmony Enterprises is thrilled that both our terminal side and airside waste handling and recycling solutions are a perfect match for the pain points expressed by these professionals. 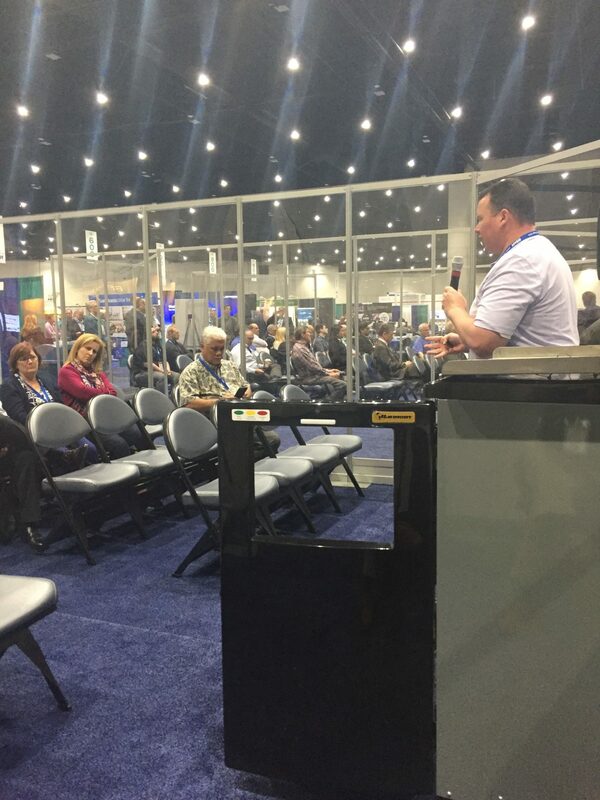 On of the highlights of the show was Harmony’s presentation in the Innovation Theater entitled, “Revolutionizing Airport Waste Handling and Recycling.” This session featured Harmony National Sales Manger, Nick Roberts, and New Business Development Manager, Lane Powell, demonstrating Harmony’s innovative dual solution of the SmartPack Automatic Compactor and Insite Wireless Monitoring Service. The SmartPack compactor is the ideal solution for the terminal side waste handling pain points expressed by airports. This revolutionary compactor has a hands-free automatic door, and is completely customizable in color, waste cube weight, amount of door openings before compaction, and door opening sensor distance. The 11:1 compaction ratio operates in a quick and quiet 10 second cycle time. Placed at gates, atriums, and concession areas, this stylish compactor eliminates the need to empty the trash more than 1-2 times per day! Insite Wireless Monitoring is an invisible technology (inside the compactor) solution that sends SMS text and email messages to employees, alerting them when the compactor is full or in need of service. This allows airport staff to complete waste tasks in a “just in time” scenario. The savings that the combination of SmartPack and Insite provide has been measured as high as 70% for airports that have implemented this system! Our ability to create customizable dashboards, interactive asset and terminal maps, and desired hierarchies of communication make this system very user friendly. The data created by Insite is also easily incorporated into larger total data integration systems already in use at many airports. At the show, Harmony also learned how our current airside solutions used by janitorial companies could be expanded to include our proven balers, compactors, and solar powered options. With the push for recycling programs, no landfill use systems, and overall improved consciousness about protecting our environment, airports are looking for affordable solutions that fit into their existing facilities. Harmony’s Quarterly Product Spotlight, the M60MD, is a perfect example of this type of solution. This low profile recycling baler fits easily beneath a standard 8′ ceiling without compromising power or efficiency. With balers like the M60MD, airports can take what was once a cost to remove recycling commodities, and turn it into a revenue source for their business. Harmony’s NBDM, Lane Powell, stands with AAAE Marketing Executive, Amanda McCollough, who had a tremendous impact on our show’s success! Trade shows require a significant investment of time and resources by exhibitors to be successful. However, this success is largely dictated by the quality of partnership provided by the host association. Harmony Enterprises would like to thank AAAE and its staff for making this show professional, rewarding, and fun! Their efforts in marketing, logistics, and overall organization are very much appreciated! Harmony Enterprises provides solutions for airport waste in addition to a number of other market verticals worldwide. Our balers, compactors, and service are just some of the reasons that airports are choosing to Experience Harmony. Our Lowest Total Cost of Ownership, True Partnership Approach, Proven Process, and Core Values are other reasons why so many airport executives put their trust in us. If you would like to learn more about how Harmony can help your airport with its waste handling and recycling, call us at 800-658-2320, or Contact Us today!